Pokemon games have all had a consistent plot formula, but the director has other plans for X and Y. The classic story of Pokemon is as follows: the trainer goes to the professor, chooses a starter, wanders from town to town fighting gym leaders, and occasionally fights a rival. Pokemon X and Y director Junichi Masuda has decided the team has had enough of that. X and Y are about the bonds between trainers and Pokemon as well as between trainers themselves. "This time we wanted to make it a journey about you and your friends," Masuda said. "When you first meet the kids at the beginning of the game, you don't actually know them, so you're meeting them for the first time." Pokemon Black and White examined the bonds between trainers and their Pokemon through N's involvement in the story and his encounters with the player, but Pokemon X and Y will be the first to redirect its focus more to the bonds between friends, straying away from the solo adventure. 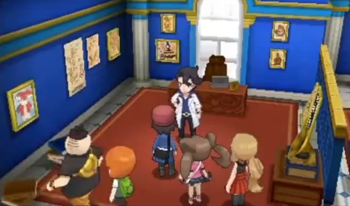 The trainer will receive his or her first starter from these friends, while Professor Sycamore gives the trainer one of the starters from Red and Blue. Masuda said this is because the professor is researching mega evolutions, and each of the original starters have a mega evolution. Masuda said the tempo of X and Y is faster; he hopes this will keep people interested in playing the game. Furthermore, just traveling by foot is faster. This change was due to Masuda's personal experiences in France, where he said everyone outwalked him. Despite the changes, X and Y look like they're going to still firmly be Pokemon games at their core, but each generation has brought its own changes.